The Greek bailout protects the financial sector, not the ordinary Greeks. 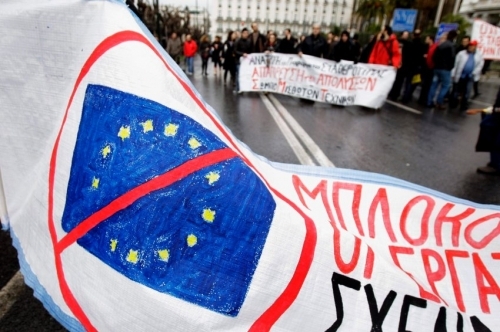 A social alternative would be for Greece to annul its debts and exit the eurozone. The emergency package for Greece is meant to protect the financial sector, not the ordinary Greeks. The alternative would be for social movements to enforce an annulment of the debt and an exit from the eurozone. What began in the autumn of 2008 as a debt crisis of banks has now mutated into a debt crisis of states. The financial press is buzzing about the impending “Lehman’s moment” for Greece and the eurozone. The second emergency package is designed to postpone that moment, but will not prevent it. The fact is that the eurozone has failed, not least because of the structural differences between core and periphery countries. Monetary union was designed as a one-size-fits-all economic policy — while participating economies were significantly different in both size and competitiveness. Because states had to give up control over their exchange and interest rates, weaker economies did not have many opportunities to compensate for their trade deficits other than by borrowing. This was already a global trend, and the core countries of the EU were only too happy to participate. German, French and Dutch banks financed the export to peripheral countries with hundreds of billions in loans, just as China is doing with the U.S. The banks, the exporters and the Greek elite filled their pockets, but the structural contradictions of debt and bubbles it led to could not be stretched out into infinity. That’s what the major players in the euro crisis — the European Central Bank, the financial sector and European leaders — are starting to find out too. Like Ireland, Portugal and Spain, Greece faces massive public and private debt, a relatively weak competitive position, a negative trade balance and exploding national debt. The priority of policymakers, however, is to keep the treadmill of loans and loan repayments up and running. At the expense of draconian budget cuts and privatizations, Greece was able to obtain a 110 billion euro loan last year to repay current debts. Any commonsensical person could have imagined that this would only aggravate the situation. In 2010, the Greek state spent 51 billion euros on interest payments alone. The economy shrank by 4.5 percent that year. The country is in a downward spiral of cutbacks, contraction and further loans. Costas Lapavitsas writes that the EU/IMF/ECB ‘Troika’ expects that, with current policies, the Greek national debt will run up to 200 percent of GDP by 2015. In other words, even those who now shout loudest that Greece must obtain new loans, know that eventually this debt is unsustainable. The question, of course, is why they continue to move heaven and earth just to push through a new emergency package. The answer is that European bankers and politicians are scared to death of a domino effect. If Greece does not repay its debt, or part of it, this would very likely lead to a new financial crisis: big banks would suffer billions in additional losses; interest rates for other would rise for other indebted countries; the European periphery would be struck by capital flight and would suffer similar problems as Greece today. This in a phase of the economic crisis in which the range of emergency measures has been largely exhausted. Hence the buzz about a ‘Lehmans moment’ for the euro area, and the immense pressure to still push through a new emergency package. But the second loan will, just as the first, only worsen the debt crisis rather than solving it. The condition for the loan is that the Greeks will have to bleed even more. They are being forced to implement harsher cuts and to sell 50 billion in state assets. There is even talk of the possibility that these measures will be implemented under the direct auspices of the ‘Troika’, a breach of sovereignty reminiscent of the semi-colonial regimes that were imposed on China, Egypt and the Ottoman Empire in the late nineteenth century. The effect of this neoliberal hemlock will be devastating. Among other things, it involves pay cuts of 40 percent, 150,000 layoffs in the public sector and increased pressure on those in Greece who do pay their taxes: the workers, pensioners and shopkeepers. This policy leaves no possibility for the economy to emerge out of its debt crisis. It’s not even a stay of execution, but a more elongated, sadistic implementation thereof. The logic behind the emergency package is to protect the banking sector and set the tone for how all European states should seize on their deficits to impose neoliberal clearcuts. As with the collapse of Lehman Brothers and the subsequent ‘rescue plan’, the debt crisis is being used as an opportunity to siphon debts from the private to the public sector. The new loans, after all, end up on the accounts of public institutions and are used to repay the extant loans, with their sky high interest rates, to the banks. Subsequently, the message to the taxpayer is that everyone needs to tighten their belts. From a human standpoint, this is insane, but this is the capitalist solution for its own crisis: robbery along class lines, increased exploitation and destruction of capital. However, there is a power factor that the “Troika” has underestimated. It is the militancy of the Greek population, which is only too well aware of the dirty games being played behind its back. The Greeks are furious with their politicians, and have had enough of the smear campaign being waged against them by the European press. The intensity of the protests of the past week marks a new phase for the resistance. It’s no longer just the unions and the radical left that carry their anger onto the streets, but much broader segments of society. Popular assemblies and workshop committees with thousands of adherents are now openly discussing how the government can be overthrown and how the debt may be declared invalid. Just let the banks bleed instead of the people. How the restructuring of the debt or a seperation from the euro zone would pan out depends entirely on the power relations within which such an event would occur. Under the continued pressure of creditors, the Greek people will suffer even more than they already do. But if a mass movement brings down the government, and, on the basis of a new representation, refuses to pay off its debts, putting companies and banks under worker control, and recovering state deficits from the wealthiest, breaking out of the euro zone straitjacket would actually offer ordinary Greeks a perspective on improvement. The fact that electricity workers went on an indefinite strike from this Monday onward, and the fact that the trade unions, budging to pressure from below, called for a general 48-hour strike during the negotiation of the next round of cuts in parliament, are indications that this alternative is not just revolutionary revelry. The bitter economic crisis and the relentless attacks from the Greek and European ruling classes are forcing ordinary Greeks to embrace radical solutions. This perspective, by the way, of leaving the euro under the pressure of a mass movement, is something very different from “kicking them out of the euro”, as right-wing populists like Geert Wilders have advocated. Through his nationalist agitation against the ‘unreliable Greeks’, he casts himself as the supposedly principled defender of the Dutch taxpayer. But in reality, he is cut from the same cloth as the Greek and Dutch elite who, through lies and deceit, put their own people on the rack. Wilders’ Freedom Party opposes the European Union, but is in reality a driving force behind the implementation of its economic guidelines. Healthcare is stripped down, social housing is dismantled in favor of the market, public officials have to swallow their ‘baseline’, the public transportation that’s not being cut away is being put to tender, and so forth. By contrast, there is money for right-wing hobbies like a mortgage discount for the wealthy, tax breaks for multinationals, and the Joint Strike Fighter. In that respect, the Greek elite does not own a patent on mismanagement and squandering tax money. The divides along which the outcome of the euro crisis is being fought out run not along the lines of nationality, but along class lines. Workers, students and retired people from different backgrounds should not allow themselves to be played out against one another, but should rather find solutions in a spirit of solidarity and common struggle. Instead of singling out ‘the Greeks’ as a scapegoat for something that the entire European establishment bears blame for, we should take an example from them: the alternative starts with the refusal to be willingly led to the slaughterhouse of austerity madness. Therein lies the hope for a different Europe. Maina van der Zwan is the Editor-in-Chief of Socialisme.nu and the national coordinator of the revolutionary socialist organization Internationale Socialisten, based in Amsterdam, the Netherlands.